Look at your sister and realise how she isn’t allowed the same rights as you. Seventy years of independence today. I’m sitting here, trying to sum up what that means for me. There are too many things that encompass this day. There are too many ways to go about it. It’s 1947. Your grandfather is fighting for his life on a train that has no food. He is holding your father tight in his arms. Your great grandmother is leaving behind her house, her jewellery, her life, to run to a place she never wanted to go. You are not yet in the picture. You have not experienced the hardships. You came when it had already ended. It’s 2017. You are fighting for your rights in a country that does not believe in equality. You’re reflecting on independence, on Partition, on all the things your ancestors went through to get to where you are today. You’re wondering where that is exactly. Is it a place where women get raped every two hours? Is it a place that kills women for acting/speaking/dressing outside of the norm? Is it a place where independence thrives? Or is it a place that kills the independent – luring you into believing that it is possible to speak your mind – and then silencing you for doing so? We are always celebrating Pakistan’s independence; independence from the British, from India, from all the shackles we wanted to be free from. Seventy years of celebrating, 70 years of building, and rebuilding, learning and forgetting, 70 years of our own people. But we celebrate like it means something more, like we’re actually independent. Let me break it down for you – I am 23-years-old, living in a country that my great grandparents and grandparents went through hell to live in. My great grandmother would tell me stories growing up. She’d talk about how she had one biscuit to divide between her five children on her journey to Pakistan, how she starved so that they could live. She told me that her house in Delhi was everything she always wanted, and so was her life. It wasn’t like her life in Karachi wasn’t great; it was just that the independence she had fought so hard to give to the women of our family doesn’t exist. It’s a figment of our imagination. I loved hearing about that time. I wanted to understand what it was like, how everyone felt, what they went through. So I’d probe my grandmother into telling me stories. Amidst tears she told me that they were forced out of their house in Delhi. They hid in a flat where they were told to keep the lights off. They were told not to speak a word. She said she could clearly recall the fear above everything else – it was her most distinct memory of all. Her father left to gather some things from their house, and while he left, a truck arrived to take them to Lal Quila, where they’d wait until they left for what was by then, Pakistan. My great grandmother refused to leave without him as she was afraid. But somehow, she managed to leave. I guess she knew that she had to do what was best for her children. When they reunited, my great grandfather conveyed that he couldn’t even manage to get to the house because there were too many bodies. Too many for him to even see over. For 10 days, they stayed in Lal Quila – they had no food for the entire duration. My grandmother and her siblings would cry for toast every single day and my great grandmother would go in search for it. She rarely found any and what she did find, she’d give to her children. My point in relaying this story is that our women were so strong during this time. They stood by their children, they left everything for their sake, yet today, they are still unappreciated. They are still pushed to the side-lines. My great grandmother did everything in her power to ensure the safety of her family, even though it meant that she may not ever see her husband again. This is bravery at its core. The most independent I have ever felt has been outside my own country – let that sink in. Imagine how it feels to not be able to live freely in a place that you call home. Moving back to Karachi after university was hard; I always knew it would be. But I began noticing things I had never even thought of back when I was in A’Levels. I noticed how I had to hide myself. My body was more of a burden than a blessing. Think about how that feels – being constantly aware of how you occupy space as a human and being told to hide that. It’s almost impossible. I know if I wanted to, I could walk the streets of Karachi. It isn’t safe? I don’t care. I’m not dressed appropriately? I don’t care. But the problem is that everyone else does. It is not just the male gaze that follows me, but it is also the female gaze. It is the older women watching as I move my way down the street, unforgiving and unashamed. They want me to be ashamed for going out without a dupatta – but I will not be. They want me to be ashamed for raising my voice against something I believe is wrong – but I will not be. Essentially, I’m lucky. My family is not conservative; they do not impose their beliefs upon me. But what about that little girl living in a village that isn’t allowed to go to school? What about that girl who is married off to her cousin because society will go crazy if she’s single at the age of 25? What about all the girls whose voices have been taken away from them? Where is their independence? Where is the independence for the women of our country? This morning, on my way to work, I saw a woman sitting on the sidewalk. She sat in a squat position – men stared and she stared back – she is one of the fearless few that do not need anyone’s approval to get by in life. I wish more of our women were like that. I wish they knew that their self-worth was not any less than a man’s. I wish they knew that they could be the breadwinners of their families. But they don’t. Because we hide them behind closed doors and stoves. We shove them into corners while their brothers go to school. I know that there are so many girls in our country who, when given the chance, could bring change. But we can’t find them. We don’t allow ourselves to. Pakistan’s literacy rate is at a staggering low – yes, schools are being built but the education budget is not even half of what it should be. All the money is being spent and all our girls are sitting on the floor of a classroom where their teachers do not show up because they aren’t being paid. Dear Pakistan, if you think you’re independent – just take a look around. This Independence Day, look at your sister and realise how she isn’t allowed the same rights as you. Look at your mother and notice how she picks up the dishes after dinner instead of your father. Look at your friends and note how they need you to drive them home at night because their parents are afraid of them taking the car on their own. Just acknowledge the lack of independence that we have. Raise your voice, because if you don’t, you’re going to lose all your girls. They will leave. They will go back to places where they have true independence, where their voices and ideas and opinions are valued. They will leave and never look back. i disagree with most of your stances. Every society has its norms and its own culture. People are not bound, but if they like then they can practice whatever they want. In Pakistan, I see a rainbow thinking, I find girls with burqas, abayas and then wearing jeans. I am anyways cool with it ! My father sometimes, picks up dishes after dinner. What’s the big deal ? Let everybody practice what they want to, Women rights and their role is inevitable in any nation’s building this; is a Gospel’s truth. WHAT KIND OF INDEPENDENCE DO YOU WANT …???? 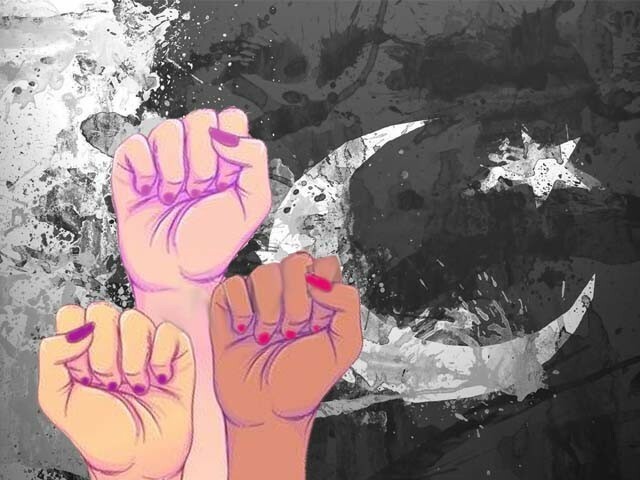 Women in Pakistan are a lot more independent then what your article tries to portray. Of course the level of independence might vary in different parts of Pakistan but it’s not all doom and gloom. I fail to fathom why people think wearing half clothes or going out without the ‘dupatta’, eating and drinking everything is the only form of independence. I’ve seen plenty of women in Pakistan working independently and competing directly against their male/female peers. As a NRP, I have also seen a lot of Pakistani women study and work here independently and they are proud of their achievements. There are fathers who work at a job as well as cook and clean dishes. Picking up kids from school, buying groceries and acting as plumber/electrician/gardener around the house is also part of their job as a man. Babysitting and carrying around children while “Begum Sahiba” does shopping in the market is also their responsibility. off at 12 years,…..then they consider themselves extremely lucky. unreported? No one knows or cares. they won’t be the subject of his ire for the day? Or singled out for whatever. That’s what happened in your family? You following in his footsteps? may they prosper, may God watch over them. They are not typical.